A World of Words: It's World Book Day! I think I've pretty much been on all sides of this one - as a child, a (trainee) teacher and now as an aunt (although the latter is obviously not as good as being a mother!). I've never been brilliant at fancy dress, so as a student I've previously come dressed as Pippi Longstocking (although I haven't read those books yet! ), and as a teacher, dressed as a (non-green) wicked witch of the west, from The Wizard of Oz. Bad costumes aside though, the day I'm referring to when I was a trainee teacher was actually by far the best day of a really stressful training course - children were encouraged to build reading forts under the tables, hold mini-performances in groups, and generally have a lot of fun with books. I wish there were more days like that, to be honest! In honour of World Book Day, I'm reviewing one of its eight '£1' books. A best-loved, rollicking, rhyming story - perfect for little ones. I must admit, this book got a little overlooked, because I bought it at the same time as the Dr Seuss books I previously blogged about, and Caitlin and Lewis went straight for those. 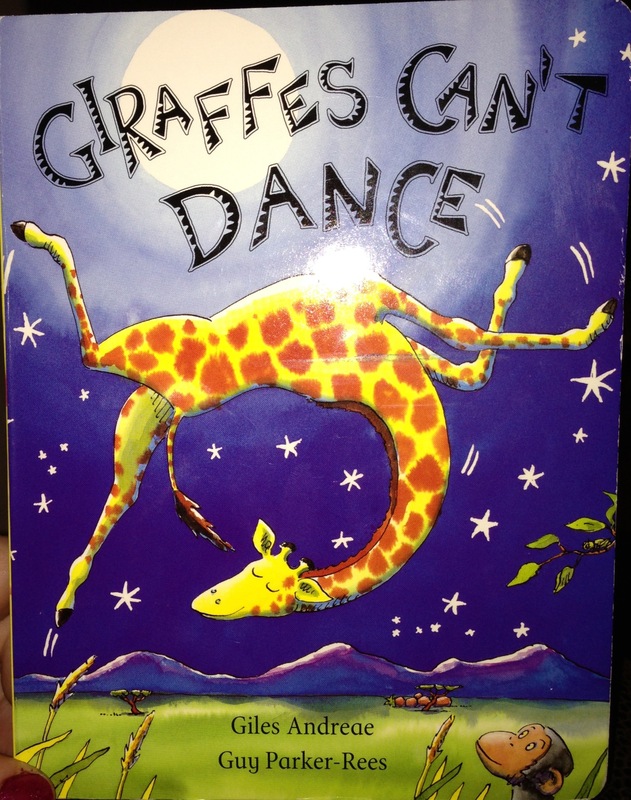 However, Caitlin loves both giraffes and dancing, so even though I've only read this story to her once, she thoroughly enjoyed it and still knows which book I'm talking about a few weeks on. First off, the illustrations in this book are, I think, the best I've seen. When the warthogs started waltzing and the lions danced the tango, neither Caitlin nor I knew what the dances entailed, but we could see from the pictures. And as you can probably see from (my bad photo of) the front cover, the contrasting colours are amazing! Every illustration stands out and makes the story even better. You just need a different song'"
I really loved the message that this sent across. Gerald is reminded that everyone is different, and so has different strengths. It reminds me of the saying that says something like if you tell a fish to climb a tree, he looks stupid; watch him swim in water though, and he's a genius. Children can really take away the positive messages and use it to build their self-confidence - not that they'll be thinking of it like that, obviously! The story is written in 4-line poems, with an ABCB rhyme scheme, which really set the rhythm well in a story about dancing. From my point of view, this made it really fun to read aloud, as well as doing all the funny voices of the laughing animals. From Caitlin's perspective, she loved the fact that most of the story could be acted out. From gently swaying necks to rock 'n' rolling rhinos, there was a multitude of things for Caitlin to engage with, and she really enjoyed it. Thoroughly recommended, for adults as much as children!